I really fancied some fruit bread in the week, so I thought I’d adapt the regular soda bread I’d made previously here. Soda bread really is my go-to bready saviour, and I tend to keep a little stock of ingredients at the ready in case I want to whip up a speedy loaf. In fact, I liked this bread so much I’m planning to make it again over the weekend! In terms of the dried fruit, it’s all just down to personal taste. My fruit mix had cherries, pineapple and sultanas, but I think figs could be lovely. 2. Sift the flour and bicarbonate of soda into a large mixing box and stir in the salt and dried fruit. Make a small well in the centre, pour in the yogurt or buttermilk and stir. The mixture should form a soft dough so if it’s a bit dry, add a dash of milk until all the ingredients combine and it becomes a bit sticky. 3. Lightly flour your worktop and tip out your dough. Knead your dough for roughly a minute and shape into a round. 4. Dust your baking tray with flour (this will prevent your bread from sticking), place your dough on the tray and then dust generously with flour. 5. Mark a deep cross in your loaf with a sharp bread knife and then place in the oven. Bake for 40-45 minutes. If you get a hollow sound when you tap the underneath then you know it’s done. Tip: If your loaf starts to brown too quickly, simply cover loosely with foil. 6. Place your bread on a wire rack to cool a little and then serve while still warm with butter. What a great idea. 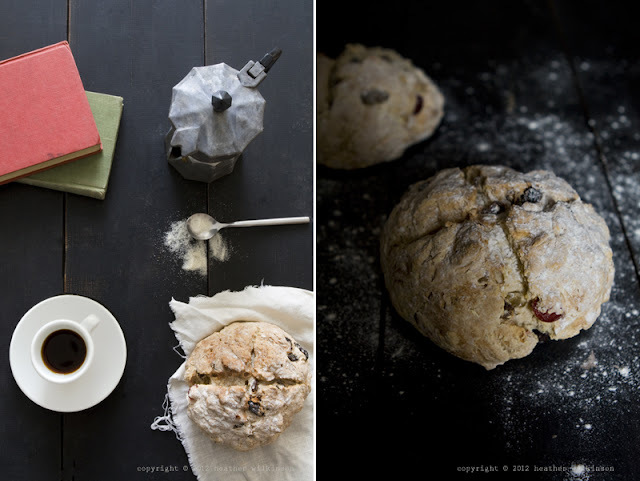 I love soda bread and make it often and never thought about putting dried fruit in.